Experimenting with one of my favourite desserts, banoffee pie. It seems the most successful cupcake recipes derive some classics stuffed into miniature cupcake form. So I thought, why not? It went down amazingly well apart from the toffee stuffing. I attempted the old condensed milk heated toffee, but it soon crystallised and the texture was a horrible sandy feeling. Bar this small problem they were delicious! I had to show you a picture of the pipping since this was my first time using one and I've been addicted to buying all the nozzles ever since. 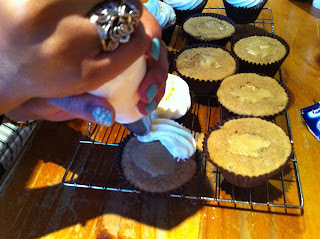 For this particular frosting I used a nozzle similar to the Wilton 1M. I thought I'd got away with saving £4 by buying a different brand, but I later learnt that the Wilton's are more expensive as they're stronger. But I'll leave that decision up to you. Cream the butter sugar and eggs. Then add mashed bananas, milk, sugar, salt, baking and bicarbonate. Slowly fold the flour before mixing well. Bake at 170 degrees for 15 minutes or until toothpick comes out clean. I used a simple butter cream recipe that you can find anywhere online. 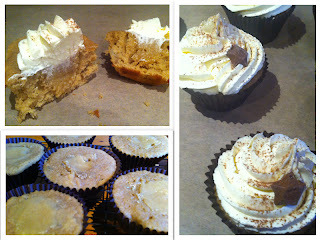 You may want to use actual cupcake cups rather than like me muffin cups as they were so big and sweet it was overkill! Great job!! They came out really cute! I love putting little surprises in the middle of my cupcakes...sorry your toffee didn't work..but hey at least they were still yummy!